Street Fighter EX Plus is an arcade game developed by Arika and published by Capcom in 1996. It is the second game in the Street Fighter EX series, but it is more of an update to the original than a sequel. All four time release characters (Darun, Allen, Kairi, and Blair), as well as secret opponents Akuma and Garuda are immediately available in this version. Four new characters can be unlocked, although none are distinct personalities. Among the four new hidden characters, players can unlock Evil Ryu, as made popular by the Street Fighter Alpha series. Another Evil character appears, this time one of the Akira developed characters, Hokuto. The remaining two hidden fighters are not really characters as much as experimental designs. Cycloid Beta is a model that has no textures on its surface, and Cycloid Gamma is a wire-frame model. Both Cycloid's moves are combinations of other character's moves. Beta's moves are all circular motions moves while Gamma's moves are all charge and hold moves. 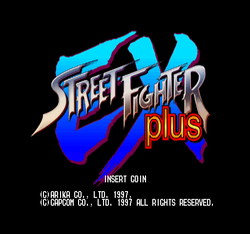 Street Fighter EX Plus was converted for play on the PlayStation, which was an easy conversion for Akira to do since the arcade hardware was based on the PlayStation architecture. The PlayStation version was released as Street Fighter EX Plus α and included Dhalsim and Sakura. This page was last edited on 13 May 2010, at 17:48.